Background and objectives: This open, prospective, randomized trial aimed to assess the effects of statins in chronic kidney disease patients on optimized antiproteinuric treatment with combined angiotensin-converting enzyme inhibition and angiotensin receptor blockade. Design, setting, participants, & measurements: After 1-month benazepril therapy followed by 1-month benazepril-valsartan combined therapy (run-in), 186 consenting patients with residual proteinuria >0.5 g/24 h were randomized to 6-month benazepril-valsartan therapy alone or combined with fluvastatin. Between-groups changes in proteinuria (primary outcome), serum lipids, and GFR were compared by ANCOVA. Analyses were blinded and by intention to treat. Results: During the run-in, proteinuria decreased more on benazepril-valsartan than on benazepril alone. Proteinuria reduction correlated with concomitant reduction in total, LDL, and HDL cholesterol, and apolipoprotein B and apolipoprotein A levels. After randomization, median proteinuria similarly decreased from 1.2 (0.6 to 2.2) to 1.1 (0.5 to 1.7) g/24 h on fluvastatin and from 1.5 (0.8 to 2.7) to 1.0 (0.5 to 2.4) g/24 h on benazapril-valsartan therapy alone. Fluvastatin further reduced total and LDL cholesterol and apolipoprotein B versus benazepril-valsartan alone, but did not affect serum triglycerides and GFR. Treatment was well tolerated. Conclusions: In chronic kidney disease patients with residual proteinuria despite combined angiotensin-converting enzyme inhibitor and angiotensin receptor blockade therapy, add-on fluvastatin does not affect urinary proteins, but further reduces serum lipids and is safe. Whether combined angiotensin-converting enzyme inhibitor, angiotensin receptor blockade, and statin therapy may improve cardiovascular outcomes in this high-risk population is worth investigating. Individuals with chronic kidney disease (CKD) have substantially higher mortality rates compared with those in the general population (1). The increased risk is multifactorial in origin, but is largely due to accelerated atherosclerosis, which in turn is driven by high prevalence of traditional cardiovascular risk factors in renal populations. The presence of proteinuria is associated with more rapid kidney function loss (2), and also increases the risks of cardiovascular morbidity and mortality (3). Dyslipidemia is a complication of both decreased kidney function and proteinuria (4) and could accelerate progression of renal disease by several mechanisms. First, tubular epithelial cells reabsorb fatty acid and cholesterol from filtered albumin and lipoproteins, which can stimulate tubulointerstitial inflammation and tissue injury (5). Second, lipoproteins may accumulate in glomerular mesangium, promoting excess matrix production and glomerulosclerosis (6). Inhibitors of the renin-angiotensin system (RAS) such as angiotensin-converting enzyme inhibitors (ACEi) and angiotensin receptor blockers (ARB) reduce proteinuria by mechanisms largely independent of BP control (7), an effect that is enhanced when they are used in combination (8–10) and is associated with significant renoprotection (10–12). They may also ameliorate the dyslipidemia associated with CKD by different mechanisms including amelioration of the nephrotic syndrome and of endothelial dysfunction, an effect that fully manifests at doses higher than those required to reduce the BP (13). Whether this effect is enhanced when they are used in combination is unknown. In animals, 3-hydroxy-3-methylglutaryl CoA (HMG-CoA) reductase inhibitors or statins, in addition to reducing LDL cholesterol, decrease proteinuria and preserve renal function and structure (14), especially when used together with ACEi and/or ARB (15). These renoprotective effects appear to be mediated, at least in part, by the limitation of inflammatory and oxidative stress, endoplasmic reticulum stress, endothelial dysfunction, and RAS activation achieved by cholesterol reduction (reviewed in reference 16). However, inhibited production of nonsteroidal compounds such as farnesyl pyrophosphate and geranyl-geranyl-pyrophosphate involved in subcellular localization and intracellular trafficking of membrane-bound proteins mediating oxidative stress injury such as Rho, Ras, and Rac GTPases may also contribute to decrease in monocyte/macrophage glomerular infiltration, mesangial proliferation, extracellular matrix accumulation, and fibrosis. Endothelin 1 inhibition and upregulation of endothelial nitric synthase expression may also play a role (16). The above mechanisms might also explain some of the effects observed in humans. Subgroup analyses of 15 trials primarily aimed at evaluating the effect of statins on serum lipids in patients at increased cardiovascular risk found that statin therapy significantly decreased proteinuria in those patients who had predialysis CKD at inclusion (17). The antiproteinuric effect was greater among patients with more proteinuria (18). Consistent with experimental data, two randomized clinical trials found that statin therapy decreased proteinuria and ameliorated dyslipidemia more effectively than placebo also in CKD patients on ACEi or ARB therapy (19,20). However, failure of a recent meta-analysis to detect a significant treatment effect on creatinine clearance decline cannot be taken to definitely exclude the possibility of specific renoprotective properties of statins because results were flawed by the unreliability of creatinine clearance to reflect true GFR changes over time, too short follow-up, and significant heterogeneity of considered trials (21). Independent of the above, whether statins limit proteinuria and dyslipidemia also in people who are already receiving combination therapy with ACEi and ARB is unknown. Thus, in the European Study for Preventing by Lipid-lowering Agents aNd ACE-inhibition Dialysis Endpoints (ESPLANADE), we addressed whether and to what extent the proteinuria and dyslipidemia of CKD are ameliorated by add-on statin therapy in hypertensive patients with CKD and residual proteinuria despite combined ACEi and ARB therapy. ESPLANADE (ClinicalTrials.gov identifier: NCT00199927) was an independent, academic study ideated and conducted by the Clinical Research Center for Rare Diseases “Aldo & Cele Daccò” of the Mario Negri Institute for Pharmacologic Research in cooperation with 16 Italian nephrology units. Investigators had access to raw data and derived data sets. Ethics committees of involved centers approved the protocol. Patients gave written informed consent according to the Declaration of Helsinki guidelines. Patients were eligible for the study if they were >16 years, with systolic or diastolic BP >140 or 90 mmHg, respectively, or had concomitant antihypertensive therapy, and 24-hour proteinuria persistently >1 g (subsequently amended to >0.5 g to avoid the unnecessary exclusion of a proportion of patients expected to have residual proteinuria >0.25 g despite dual RAS blockade) after 2-month washout from previous treatment with RAS inhibitors or statins, with variation in creatinine clearance <30% over the last 3 months without evidence of urinary tract infection or heart failure. The following resulted in some patients being excluded from the study: creatinine clearance ≤20 ml/min per 1.73 m2, with LDL cholesterol >190 mg/dl despite low-cholesterol diet, or on chronic treatment with corticosteroids, nonsteroidal anti-inflammatory drugs, or immunosuppressive drugs; acute myocardial infarction or cerebrovascular accident in the 6 months preceding the study; systolic/diastolic BP ≥220/115 mmHg; renovascular disease; obstructive uropathy; type 1 diabetes mellitus; vasculitis; cancer; serum aminotransferase concentrations >3 times the upper limit of normal; chronic cough; history of poor tolerance or allergy to ACEi, ARB, or statins; drug or alcohol abuse; legal incapacity; pregnancy; breast-feeding; and ineffective contraception. Patients with ongoing treatment with HMG-CoA reductase inhibitors, ACEi, or ARB who in the investigators' judgment had a specific contraindication to temporary withdrawal of any of these treatments were excluded. After a 2-month washout period from previous treatment with ACEi, ARB, statins, or potassium sparing diuretics (if applicable) eligible patients submitted three consecutive 24-hour urine collections and those with mean 24-hour proteinuria >0.5 g at the inclusion visit had a baseline evaluation of clinical and laboratory parameters (Table 1) and entered a 2-month run-in phase. At inclusion benazepril was started at 10 mg/d. If 7 to 10 days later the patients did not report symptomatic hypotension and had no other treatment-related adverse events (including serum potassium increase to >5.5 mEq/L or serum creatinine increase exceeding 30% versus inclusion), benazepril was increased to 20 mg/d. At 1 month, valsartan 80 mg/d was added to the regimen and then increased to 160 mg/d as tolerated after 7 to 10 days. At completion of the second month of the run-in, baseline evaluations were repeated and the GFR was measured (22). At the end of the run-in phase, patients with residual 24-hour proteinuria >0.25 g were centrally randomized 1:1 to receive fluvastatin or no HMG-CoA reductase inhibitor therapy. The randomization was open and controls on no HMG-CoA reductase inhibitor therapy did not receive a placebo tablet instead of fluvastatin. The minimization method was used to achieve a balanced distribution of patients with/without diabetes and 24-hour proteinuria </≥3 g in the two groups (23). Patients who at the randomization visit had 24-hour proteinuria ≥0.25 g entered the treatment period. Patients randomized to statin received fluvastatin in addition to ongoing benazepril-valsartan therapy; controls were maintained on benazepril- valsartan therapy alone. In both groups patients were maintained on benazepril and valsartan at the doses achieved at the end of the run-in phase. Fluvastatin was started at the dose of 40 mg/d. The dose was then increased to 80 mg/d after 1 month if treatment was well tolerated. In both groups, baseline evaluations were repeated at 3 and 6 months after randomization (final visit). Patients and their medical doctors were aware of treatment allocation, whereas nurses involved in BP measurement and collection of biologic samples, as well as technicians and statisticians in charge of laboratory measurements and data handling and analyses, respectively, were blinded to treatment. As per clinical practice, patients with proteinuric CKD attending the outpatient clinics of involved centers were recommended to limit their sodium intake to 60 mmol/d or less, to eat about 0.8 g/kg per day of proteins per kilogram of body wt, to limit cholesterol intake to <200 mg/d, and restrict caloric intake if overweight. At inclusion these recommendations were reinforced, but no change in sodium, protein, cholesterol, or calorie intake was introduced. Throughout the study antihypertensive therapy was titrated to target BP ≤130/80 mmHg. Target was maintained with the study drugs and additional antihypertensive agents if necessary. Diuretics were first-line therapy, followed by sympatholytic agents (including β-blockers) and peripheral vasodilators. Dihydropyridine calcium channel blockers were last choice (24). Potassium sparing diuretics and ACEi or ARB different from the study drugs were not allowed. BP was the mean of three values taken 2 minutes apart, after 5 minutes rest in the sitting position, on the same arm by a standard sphygmomanometer. Urinary proteins were measured centrally at the coordinating center by a Beckman-Coulter LX20 Pro (pyrogallol red-molybdate method) in three consecutive 24-hour urine samples collected during the 3 days prior the day visit. The GFR was measured centrally by the iohexol plasma clearance technique (22). This superiority study tested the hypothesis that statins combined with ACEi and ARB might reduce 24-hour proteinuria, the primary efficacy variable, more effectively than ACEi and ARB alone. On the basis of previous studies, proteinuria was predicted to average 1.4 ± 1.5 g/24 h at the end of the run-in phase (8) and a 50% reduction (i.e., 0.7 g/24 h) was expected to occur in the statin group at the end of the treatment period versus no change in the control group (19,25). Ninety patients per group were required to give the trial 80% power to detect a statistically significant reduction in the primary outcome (P < 0.0492 based on an α-spending function adapting an O'Brien and Fleming rule (26), allowing for one interim and one final analysis) and assuming a 10% dropout rate. Screening had to be continued until 180 patients were randomized. Those that at that time were already in the washout or run-in phase had to be continued in the study. Statistical analysis was by the intention-to-treat principle. Groups were compared by analysis of covariance (ANCOVA), adjusting for baseline measurement, or by χ2 test as appropriate. Urinary proteins, serum triglycerides, liver aminotransferase, and creatine phosphokinase levels were log-transformed before analysis. Within-group comparisons were assessed by paired t test, Wilcoxon signed-rank test, or McNemar test as appropriate. Correlations were performed using Spearman's rank correlation coefficient. Data are presented as N (%), mean ± SD, or median and interquartile range. All of the statistical analyses were performed at the Laboratory of Biostatistics of the Clinical Research Center by using SAS version 9.1 (SAS Institute Inc, Cary, NC). Between July 2003 and July 2007, 217 potentially eligible patients were screened. At the inclusion visit 30 of them did not fulfill the selection criteria and one was lost to follow-up. Thus, 186 patients aged 51.4 ± 13.9 years entered the run-in (Figure 1; Table 1). Of these, 141 (75.8%) were males, 32 (17.2%) had type 2 diabetes, and 102 (54.8%) currently smoked. In 113 (60.8%) patients the starting dose of benazepril (10 mg/d) was uptitrated to 20 mg/d and this dose was maintained up to the end of the run-in. At 1 month all patients also received 80 mg/d of valsartan and in 95 (51.1%) the dose was uptitrated to 160 mg/d and then maintained up to the end of the run-in. Both systolic and diastolic BP progressively decreased (P < 0.001 for both trends) and the proportion of patients achieving BP target progressively increased on benazepril and benazepril-valsartan (Table 1) therapy. Twenty-four–hour proteinuria and protein/creatinine ratios measured in spot morning urine samples or 24-hour collections progressively decreased on benazepril and benazepril-valsartan combined therapy, respectively (P < 0.001 for trend for all comparisons) (Table 1; Figure 2, upper panel). In 9 patients (4.8%) on benazepril and 25 (13.5%) on dual RAS blockade 24-hour proteinuria decreased to <0.5 g, respectively (Table 1). No significant interaction was found between level of 24-hour proteinuria (≥3 or <3 g) or diabetes status (Yes/No) at inclusion and treatment effect on urinary proteins. Changes in proteinuria (upper panel) and serum lipids (lower panel) achieved by benazepril alone or benazepril combined with valsartan as compared with inclusion. Data are median and interquartile range for urinary proteins and mean ± SEM for serum lipids. UP, urinary proteins; P/C, protein/creatinine ratio; Chol., cholesterol. Total and LDL cholesterol progressively decreased (P < 0.001 and P = 0.005 for both trends, respectively) on benazepril and benazepril-valsartan therapy, respectively (Table 1; Figure 2, lower panel) and the proportion of patients with total or LDL cholesterol levels <200 mg/dl or <100 mg/dl significantly increased compared with inclusion (Table 1). These changes were paralleled by a concomitant decrease in HDL cholesterol and apolipoprotein A levels (Table 1). 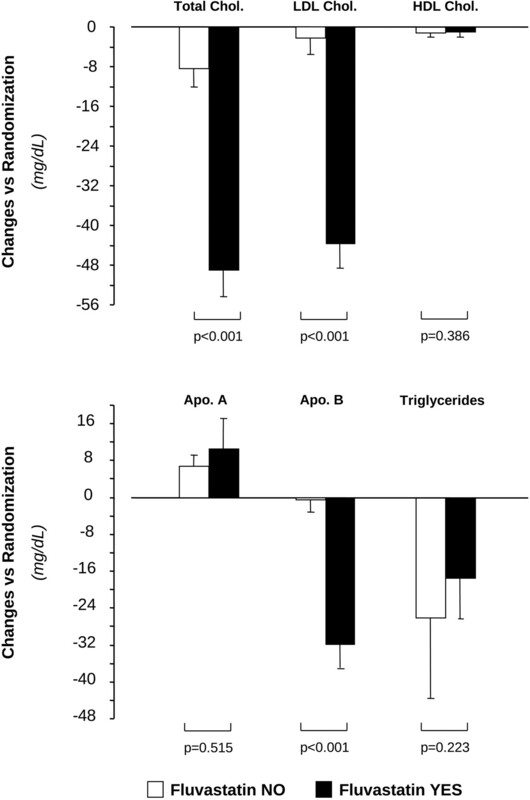 No appreciable changes were observed in LDL/HDL cholesterol ratio, apolipoprotein B, and triglyceride levels (Table 1). The effects on serum lipids were independent of the severity of proteinuria and of serum albumin levels at inclusion. Serum albumin and potassium levels significantly increased during the run-in, whereas GFR significantly declined by 3.3 ± 11.6 ml/min per 1.73 m2 versus inclusion (Table 1). On benazepril, changes in total (rho = 0.26, P < 0.001), LDL (rho = 0.27, P < 0.001), and HDL (rho = 0.16, P = 0.042) cholesterol, and in apolipoprotein A (rho = 0.34, P < 0.001) and B (rho = 0.38, P < 0.001), were significantly correlated with concomitant changes in proteinuria. Similar correlations were found on benazepril-valsartan therapy (Figure 3). 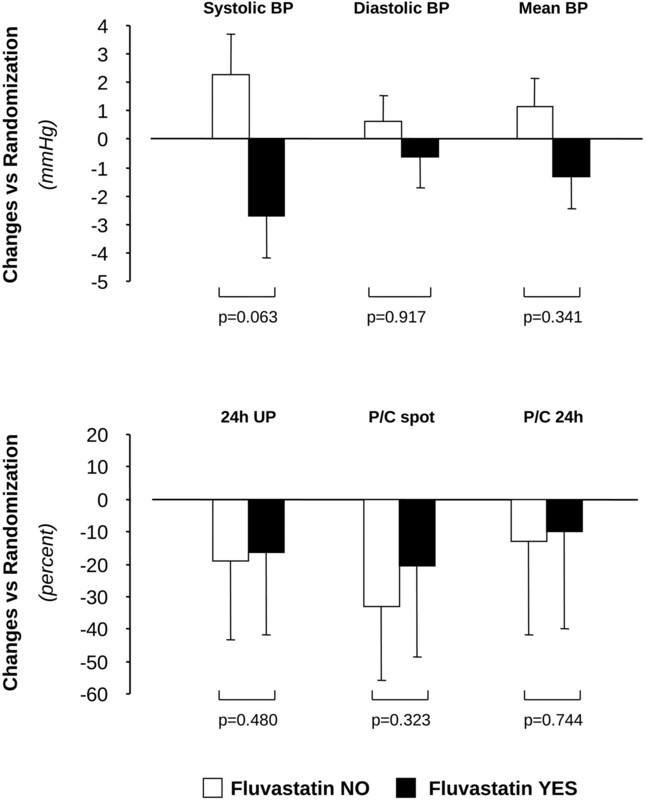 Correlations between change in 24-hour proteinuria on benazepril combined with valsartan versus inclusion and concomitant changes in serum total, LDL, and HDL cholesterol, apolipoproteins A and B, and triglyceride levels. There were 14 cases of hypotension and 13 of hyperkalemia not requiring treatment withdrawal. Serum potassium never exceeded 6 mEq/L. Of the 186 patients completing the run-in, 92 were randomly allocated to add-on fluvastatin therapy and 94 were maintained on ongoing benazepril-valsartan therapy (controls). Clinical and laboratory characteristics (Table 2), the proportion of males (75.0 versus 76.6%), patients with type 2 diabetes (17.4 versus 17.0%), and people who currently smoke (50.0 versus 59.6%) were similar in the fluvastatin and control groups, respectively. Six (6.5%) patients in the fluvastatin group and 5 (5.3%) in the control group had known CV disease. Fifty-five (59.8%) patients on fluvastatin and 48 (51.1%) controls were on full recommended benazepril and valsartan doses, respectively. The remaining patients were receiving a median dose of 10 mg/d of benazepril and 80 mg/d of valsartan in combination. The proportion of patients on one or more concomitant antihypertensive medications was similar in both groups at randomization and during the treatment period (Table 3). At randomization five patients allocated to fluvastatin and one control had 24-hour proteinuria <0.25 g and did not enter the treatment period. Thus, 87 patients on fluvastatin and 93 controls continued the study. Two patients on fluvastatin and five controls were withdrawn because of adverse events and two other patients on fluvastatin were lost to follow-up. Thus, 83 patients on fluvastatin and 88 controls completed the treatment phase (Figure 1). In all patients on fluvastatin the dose was uptitrated to 80 mg/d and in no case was backtitrated because of adverse events. Proteinuria tended to decrease (Figure 4, lower panel) without significant differences between groups (Table 2). Systolic BP tended to decrease in patients on fluvastatin and to increase in controls (Figure 4, upper panel), but BP differences between groups were nonsignificant (Table 2). Changes in arterial BP (upper panel) and proteinuria (lower panel) achieved by 6-month fluvastatin or non–HMG-CoA reductase inhibitor therapy as compared with inclusion. Data are mean ± SEM for BP and median and interquartile range for urinary proteins. UP, urinary proteins; P/C, protein/creatinine ratio. Fluvastatin add-on therapy led to further significant reductions in total and LDL cholesterol levels both at 3 and 6 months after randomization. Fluvastatin also decreased apolipoprotein B levels, without affecting serum HDL cholesterol, triglycerides, and apolipoprotein A levels. Thus, also the LDL/HDL ratio significantly decreased at both time points versus randomization. No significant changes in serum lipids were observed in controls (Table 2; Figure 5). Thus, at both time points changes in total and LDL cholesterol and in apoliprotein B levels were significantly different (P < 0.001 for all comparisons) between the two treatment groups (Figure 5), as well as the concomitant changes in LDL/HDL ratios (−24.4 versus +5.1% at 6 months, P < 0.001). Consequently, total and LDL cholesterol, LDL/HDL ratio, and apoliprotein B serum levels were significantly lower in the fluvastatin than in the control group (Table 2). The proportion of patients with total and LDL cholesterol levels within recommended ranges increased progressively and significantly in the fluvastatin group but did not appreciably change in controls (Table 2). Thus, the incidence of patients with uncontrolled cholesterol at randomization who achieved target total (57.1 versus 18.4%) and LDL (44.3 versus 12.5%) cholesterol levels at 6 months was significantly different (P < 0.001 for both comparisons) between groups. Similar findings were observed at 3 months. Changes in serum lipids achieved by 6-month fluvastatin therapy or non–HMG-CoA reductase inhibitor therapy. Data are mean ± SEM. Chol., cholesterol; Apo A, apolipoprotein A; Apo B, apolipoprotein B.
GFR numerically decreased in fluvastatin-treated patients, but differences between groups were not significant (Table 2). No significant change was observed in other considered variables (Table 2). Although liver transaminase and creatine phosphokinase serum levels tended to slightly increase in the statin group, in no case were these changes considered clinically relevant and induced to patient withdrawal. In this prospective, randomized, controlled clinical trial evaluating the outcomes of a large and homogeneous cohort of hypertensive patients with chronic nephropathy and residual proteinuria despite combined benazepril and valsartan therapy, 6-month add-on therapy with the HMG-CoA reductase inhibitor fluvastatin did not affect urinary proteins but remarkably reduced total and LDL cholesterol and apoliprotein B levels and, compared with dual RAS blockade alone, increased by almost threefold the proportion of patients achieving the recommended LDL target of 70 mg/dl. Fluvastatin add-on therapy also reduced the systolic BP compared with dual RAS blockade alone and was well tolerated. No patient on combined therapy prematurely withdrew because of treatment-related adverse events. Overall, add-on statin therapy achieved changes in serum lipid profile that unequivocally reduce the overall cardiovascular risk. Improvements in long-term cardiovascular outcomes achieved by amelioration of dyslipidemia in patients with chronic kidney disease should be even greater than those in the general population (27), in particular if treatment, as in our present study, is started in early stages, largely before progression to terminal kidney failure and need for renal replacement therapy when statin therapy does not appear to appreciably affect cardiovascular outcomes (21,28). Whether statins are cardioprotective in patients with stage 4 to stage 5 CKD who are on conservative therapy is also uncertain. However, finding that effects on serum lipids were not accompanied by appreciable changes in urinary proteins is in apparent contrast with previous smaller studies showing an antiproteinuric effect of statins in CKD patients, including those on ACEi or ARB therapy (17–20,25,29), and suggests that statin add-on therapy would unlikely confer additional renoprotection in renal patients on dual RAS blockade. In studies reporting an antiproteinuric effect of statin therapy, proteinuria reduction was invariably observed within 3 to 6 months of treatment (19,25,29). Thus, in this study failure to detect any effect of statin therapy on urinary proteins could not be explained by a too shot treatment period. Moreover, finding that proteinuria tended to decrease more in controls than in patients on fluvastatin and that this trend was not explained by unbalanced distribution of risk factors in the two study groups strongly suggests that data reflected a real failure of the study drug rather than an insufficient statistical power to detect a small treatment effect. The reliability of the study findings was also enhanced by the fact that to limit the confounding effect of random data fluctuations, we considered for statistical analyses the mean value of measurements in three consecutive 24-h urine collections and centralized all evaluations in a core laboratory. A mechanistic explanation for the above findings could be that in our patients optimized antiproteinuric therapy with dual RAS blockade reduced residual proteinuria to such an extent that the power of the analyses to detect an additional antiproteinuric effect of add-on statin therapy was also reduced, independent of the involved mechanisms (direct or mediated by cholesterol reduction). For the same reasons, these data cannot be taken to definitely exclude the possibility of a cause and effect relationship between amelioration of dyslipidemia and proteinuria reduction. Careful BP monitoring allowed detection of a trend toward additional reduction in systolic BP achieved by 6 months of fluvastatin therapy compared with non–HMG-CoA inhibitor therapy, which is consistent with previous evidence that statins may have a specific antihypertensive effect associated with improvements in endothelial function and flow-mediated vasodilation (30). Although modest, this BP-lowering effect has been suggested to contribute to the cardiovascular benefits of statins, in particular, to those arising too swiftly to be explained by the achieved changes in serum lipids. Our present findings suggest that this effect extends also to CKD patients who have their BP controlled by dual RAS blockade. A secondary but not less important finding of our study was that, during the run-in phase, dual RAS inhibition, added-on to ongoing non-RAS inhibiting antihypertensive therapy, in addition to further ameliorate BP control reduced urinary proteins by >50%. Proteinuria reduction was paralleled by a significant increase in serum albumin and a decrease in total and LDL cholesterol and apolipoprotein A levels. Changes in urinary proteins and serum lipids achieved by dual RAS blockade were significantly correlated, and largely exceeded the changes achieved by benazepril alone. This is consistent with previous evidence that proteinuria reduction may mediate at least part of the lipid-lowering effects of RAS inhibitor therapy (13). Amelioration of endothelial dysfunction and/or lipid catabolism and correction of hypoalbuminemia in those with the nephrotic syndrome may also contribute (10). Our data extend previous evidence from smaller series that dual-drug more effectively than single-drug RAS blockade reduces proteinuria in patients with chronic kidney disease, and is safe (9,10). Thus, concerns about the risk/benefit profile of combined ACEi and ARB therapy raised by data from patients that in the large majority of cases were normo- or microalbuminuric and had a normal kidney function (31) cannot be extrapolated to patients with proteinuric nephropathies (32) who, in actual fact, have their risk of progression to end-stage kidney disease almost fully blunted by this therapeutic approach (10). Addressing whether more effective proteinuria reduction achieved by combined benazepril and valsartan therapy compared with benazepril alone was explained by more BP reduction, more effective inhibition of the RAS, or both was beyond the purposes of this study. Independent of the above, however, several studies have consistently reported that proteinuria reduction is one of the most effective ways to slow renal disease progression (2) and to reduce cardiovascular morbidity and mortality in patients with CKD (33). Actually, the extent of proteinuria reduction was found to predict the extent of risk reduction for both renal and cardiovascular events in this population (2,33). Thus, finding that proteinuria decreased more on combined benazepril and valsartan therapy than on benazepril alone, and that this reduction was greater than in other series of patients on single-drug RAS inhibitor therapy (8,9), suggests that in the long term combination therapy might be more reno- and cardioprotective than either drug used alone. Data in animals and preliminary observations in humans raised the concern that statins may be nephrotoxic. However, no study evaluating the renal effects of statin therapy measured the GFR with gold standard techniques. Here we observed that 6-month fluvastatin therapy given at the highest recommended dosage (34–37) was associated with a significant, albeit numerically small, GFR reduction as assessed by the iohexol plasma clearance technique (22). Whether this effect, not accompanied by appreciable changes in urinary proteins, reflects a clinically relevant nephrotoxicity of fluvastatin therapy needs to be addressed in future investigations. The run-in phase did not include a control arm with 2-month treatment with an ACEi alone; thus, we cannot provide the evidence that dual-drug more than single-drug RAS blockade reduced proteinuria and lipids in the setting of a parallel group design. However, no previous study found changes in urinary proteins with single-drug RAS blockade—even with high doses of an ACEi or an ARB—comparable to those we observed with the benazepril-valsartan combination (8,9). Moreover, no other study found similar effects on serum lipids, even when doses of ACEi or ARBs largely exceeding the doses recommended to achieve BP control were used (13). Another limitation is that our present findings apply to patients with relatively well-preserved GFR and whether they can be extrapolated to patients with lower GFR is not known. Among the strengths of the study are the careful BP monitoring and the centralized measurements of proteinuria and GFR by gold standard procedures. In patients with chronic nephropathies on combined benazepril-valsartan therapy add-on fluvastatin therapy did not affect urinary proteins but further enhanced the lipid-lowering effects of dual RAS inhibition, and was well tolerated. Controlled clinical trials may help address whether combined HMG-CoA reductase and dual RAS inhibitor therapy may synergistically contribute to improving cardiovascular outcomes in this high-risk population. M.T. was supported by salary awards from the Alberta Heritage Foundation for Medical Research and the Canadian Institutes of Health Research, as well as by an alternative funding plan from Alberta Health and Wellness and the University of Alberta. The study was supported by a grant from Regione Lombardia, Direzione Generale Sanità, Milan (Italy) and Novartis Farma S.p.A., Varese (Italy). Novartis Pharma also supplied the benazepril (Cibacen), valsartan (Tareg), and fluvastatin (Lescol) tablets required for study conduction. Novartis Pharma had no involvement in study design; in the collection, analysis and interpretation of data; in the writing of the report; or in the decision to submit the paper for publication. The authors thank all of the nurses and doctors for careful management and monitoring of the study patients. Paola Boccardo cooperated with the investigators for protocol submission to the ethics committees and institutional review boards of the coordinating center and involved hospitals. Manuela Passera helped to prepare the manuscript. Members of the ESPLANADE Study Group were G. Remuzzi (principal investigator); Piero Ruggenenti (study coordinator); Flavio Gaspari, Silvia Ferrari, Clara Petrò, Elena Savoldelli, and Nadia Stucchi (laboratory measurements); Nadia Rubis, Giulia Gherardi, Wally Calini, Chiara Defendini, Olimpia Diadei, Greta Noris, Daniela Rossoni, Davide Villa, and Gloria Villa (IMP distribution, case report form, and study monitoring); Giovanni Antonio Giuliano (treatment assignment secretariat); Annalisa Perna and Nicola Motterlini (data analysis); Bogdan Ene-Iordache and Sergio Carminati (database and data validation); Paola Boccardo and Andrea Goméz (administrative and ethical committee procedures); Norberto Perico and Nadia Rubis (pharmacovigilance); Sara Peracchi (study secretariat). Participating centers [number of recruited patients] of the ESPLANADE Study Group were Istituto di Ricerche Farmacologiche Mario Negri, Centro di Ricerche Cliniche per le Malattie Rare Aldo e Cele Daccò, Bergamo, Italy : Norberto Perico, Agustina Anabaya, Carlos Raul Chiurchiu, Simona Gamba, Mariana Rasheva Kotlarova, Giovanna Franca Ledda, Giacomina Loriga, Giuseppina Malighetti, Stefano Rota, Elena Terzieva, and Svitlana Yakymchuk; Istituto di Patologia Speciale Medica dell'Università degli Studi di Sassari, Sassari, Italy : Andrea Satta and Giacomina Loriga; Azienda Ospedaliera Vittorio Emanuele II, S. Bambino, Ferrarotto, Catania, Italy : Elvia Sicurezza and Antonio Granata; Ospedale Acireale S. Marte e S. Venere, Acireale, Catania, Italy : Giovanni Battaglia, Maurizio Garozzo, Giovanni Leotta, and Maria Concetta Trovato; Azienda Ospedaliera Ospedali Riuniti CNR-IBIM, Reggio Calabria, Italy : Carmine Zoccali and Francesco Cambareri; Azienda Ospedaliera di Parma, Parma, Italy : Salvatore David and Chiara Grasselli; Ospedale Santa Maria Annunziata, Bagno a Ripoli, Firenze, Italy : Francesco Pizzarelli, Pietro Dattolo, and Stefano Michellassi; Presidio Ospedaliero Giuseppe Mazzini, Teramo, Italy : Goffredo Del Rosso, Roberto Ripani, and Patrizia Santarelli; Presidio Ospedaliero di Mestre-ULSS 12 Veneziana, Mestre, Venezia, Italy : Mariano Feriani and Pierpaolo Toffoletto; Azienda Ospedaliera Padova, Padova, Italy : Agostino Naso and Mirca Rebeschini; Ospedale Regionale Careggi Monna Tessa, Firenze, Italy : Maurizio Salvadori, Paola Becherelli, and Marco Gallo; Ospedale S. Giacomo Apostolo, Castelfranco Veneto, Treviso, Italy : Massimo De Luca and Cataldo Abaterusso; Ospedale Casa Sollievo della Sofferenza, San Giovanni Rotondo, Foggia, Italy : Carmine Stallone and Antonio Del Giudice; Azienda Ospedaliera Ospedale Civico e Benefratelli, G. di Cristina e M. Ascoli, Palermo, Italy : Ugo Rotolo and Carlo Gianmaresi; Ospedale del Valdarno - Santa Maria alla Gruccia, Montevarchi, Arezzo, Italy : Carlo Mura and Filomena Panza. Azienda Ospedaliera Pugliese Ciaccio, Catanzaro, Italy : Luigi Lombardi and Angela Rosa Pinciaroli.